An expanded Garmin International, Inc. Connext ecosystem that now includes the FltPlan.com website and the FltPlan Go app on Apple and Android mobile devices has been released. 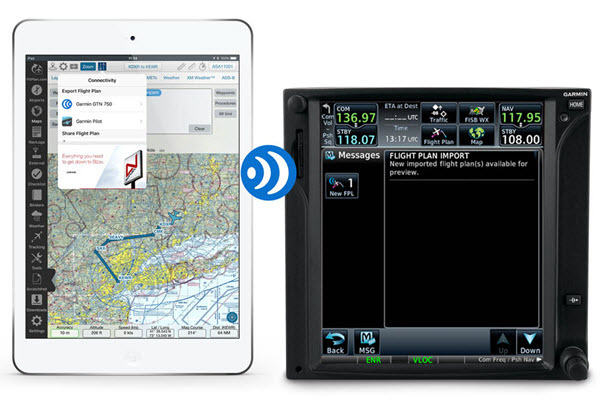 With compatible Garmin avionics (features and compatibilities vary, see website for additional details), pilots can simply create a flight plan within the FltPlan.com website, share it within the FltPlan Go app and wirelessly transfer it to select avionics once they arrive to the aircraft via the app on a mobile device. FltPlan Go customers can also wirelessly receive and display aviation weather products from various sources including Flight Information Service-Broadcast (FIS-B) as well as Automatic Dependent Surveillance-Broadcast (ADS-B) traffic, GPS position data and back-up attitude information. Flight Stream 210 and GTN 650/750 or GNS™ 430W/530W. In addition, flight plans may be transferred from FltPlan Go to the Garmin Pilot application for iOS and Android users. When paired with compatible avionics (features and compatibilities vary, see website for additional details), the FltPlan Go app can wirelessly communicate with select Garmin products to display ADS-B traffic, FIS-B weather and audio entertainment within the app. Select Garmin products also power synthetic vision to display dynamic pitch and bank information alongside highly accurate WAAS GPS position information. Connext wireless compatibility is extended to the FltPlan.com website and FltPlan Go app and includes the following Garmin products: Flight Stream 510/210/110 (The Flight Stream 110 will not have flight plan transfer capabilities), GTX™ 345 series, GDL® 88/84 series, GDL 69 series, GDL 52 series, and GDL 39/GDL 39 3.